On-resistance as low as 45&Omega; at 1.5V rating. VISHAY Intertechnology, represented in Australia by Braemac , has released five p-channel load switches, offering low on-resistance at a 1.5V gate drive. To minimise power consumption and increase battery life, many of the ASICs found in portable electronics systems are designed to operate at core supply voltages between 1.5 and 1.65 V.
The MOSFETs can work directly from 1.5V core supply voltages with on-resistance as low as 45mΩ. With their low threshold voltage and guaranteed specifications at a 1.5V gate drive, the devices eliminate the need for level-shifting circuitry and maximise the power-saving benefits of low operating voltages in battery-operated systems. 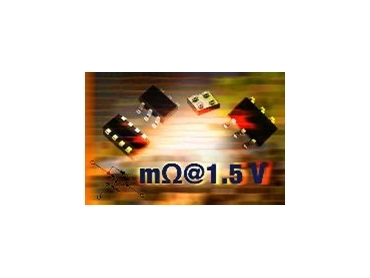 The five power MOSFETs include two devices in the Little Foot TSOP-6 with 20V (Si3495DV) and 8V (Si3499DV) drain-to-source breakdown voltages and on-resistance ratings at a 1.5V gate drive of 47mΩ and 45mΩ respectively. The 8V Si8419DB, Si5499DC, and Si1499DH are available in the Micro Foot, 1206-8 ChipFET and SC-70 packages. They are rated for a 1.5V gate drive. With their compact package designs they also reduce footprint area dramatically and enable more flexible end-system design.